Are you interested in playing in a Live Charity Poker Tournament, but not sure what to expect? 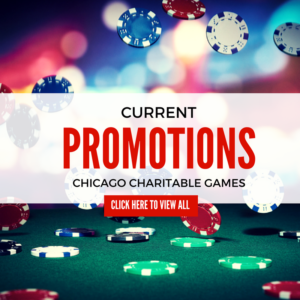 Our first timers guide to playing charity poker at Chicago Charitable Games should help! If you still have questions after reading, please post a comment below or contact us. Every event is open to the public – new faces are always welcome! You must be at least 18 years old to play – and we will card you. YES! you win real cash payouts, but the hosting charity keeps a portion of every game played just like a casino would. For example, out of the $20 buy in for the Early Bird Tournament, $15 goes into the prize pool, and $5 goes to the hosting charity. If the 1st place prize is $500… you would go home with $500 in cash! There is no other fee besides the rake taken from your original buy in. Want to know what games are running right now at the event? The website is always the best place to go and see where we are going to be next. 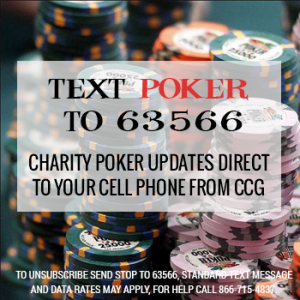 Go to: www.CCG.poker/events for the latest information on upcoming charity poker events in Chicago. We also post live event updates with current cash games running, how many players in the current tournament and late registration information. Follow us on Facebook or Twitter. You can find the full charity poker schedule on our events page. Time: Typically 2:00pm – 1:00am on Friday & Saturday, and 2:00pm – 12:00am on Thursday’s & Sunday’s but be sure to check the event page for anything out of the ordinary. Benefiting Charity: This is the hosting charity for the event – you’re helping them raise money! Multi-Table Tournament Schedule: These are the different tournaments played throughout the night. 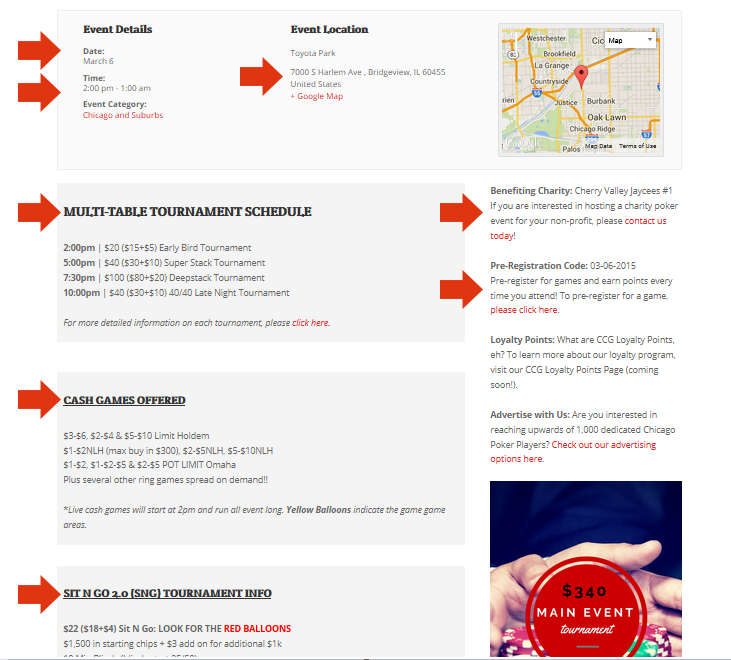 You can learn the specifics about each game on our Multi-Table Tournament Page. Tournaments vary by event. Cash Games: The most popular games are: $1/$3 No Limit Holdem (NLH), $1/$1 NLH, and $1/$2/$5 PLO. You can learn more about our cash games on the Cash Game Page. Sit-N-Go Games: $25 and $55 Single Table Tournaments are offered at every event. Sit n Go’s are offered all event long & start on demand as soon as there are 8 of the 10 players bought in (the reaming two seats can be bought after the tournament starts but before the end of level 5. You can learn the specifics about each game on our Single-Table Tournament Page. Multi-Table Tournaments: Multi-Table tournaments are scheduled throughout the day, and you want to arrive roughly 15-30 minutes prior to the start of the tournament. A Multi-table tournament is your standard tournament you see on TV watching poker. Several tables start the tournament, and all those players play down until there is one player left with all the chips. Typically the top 10-12% of the field are paid out, with roughly 30-40% going to the winner of the tournament. Sit N Go’s & Cash Games: These games are played on demand, meaning as soon as there is enough players the game starts. That means you can come any time and get into a Cash Game or Sit N Go. 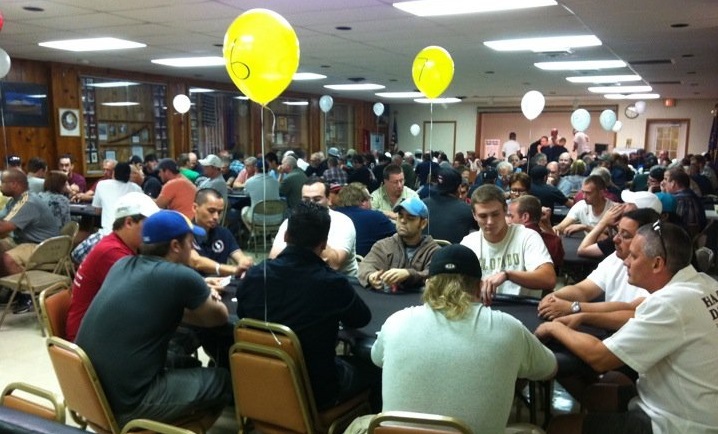 Single Table Tournaments are just mini tournaments that start with ten players. As soon as ten players sign up the tournament starts and another single table tournament sign up table is announced. Cash Games start with 4-5 players, and you can always find out what games are running by going to the Cash Game check in area. The most popular cash game is $1/$3 NLH. When you arrive, your first stop is always the Charity Bank. At the Charity Bank, you need to either (A) Buy Chips or (B) Buy Your Tournament Seat. *All chips are purchased at the Charity Bank. You can only purchase chips with cash or a credit card, and there is no minimum buy in or cost to purchase chips. $100 in cash will get you $100 in chips. You’ll also be asked to fill out a player card – this is used to buy or sell chips at the bank. This is not a home game. CCG adheres to strict rules of poker (TDA rules for Tournaments) and you may be penalized if you break those rules. You can find a copy of our rules here. Whenever you have a question or a concern, ask the dealer. If you do not like the dealers answer or are still unsure you can ask to speak to the floor. The floor’s decision is final. Be respectful of other players in the game. Remember this is fun, have fun and enjoy yourself.